Diamonds are forever.. A beautifully crafted 18ct white gold ring proudly presents a solitaire Forever Diamond. A sparkling spotlight stealer, this delightful diamond ring also features glistening detailing both surrounding and below the center piece, with a shimmering conjoining cross design showcasing the white gold body. 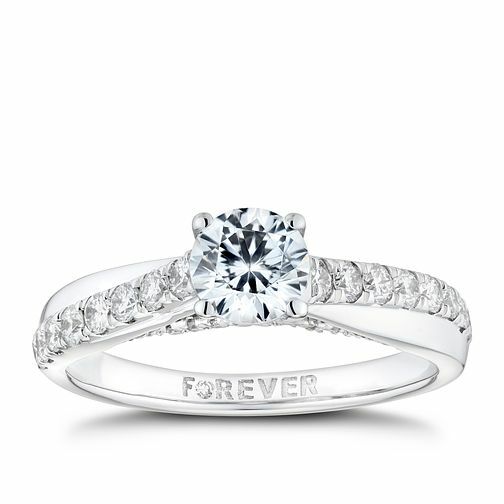 The word 'FOREVER' is engraved on the inside of the ring, with an additional sparkle taking the place of the 'O'. A special and sentimental touch, the perfect way to express how much a loved one means to you, forever and always. The total diamond weight for this ring is 1ct. 18ct White Gold 1ct Solitaire Forever Diamond Ring is rated 5.0 out of 5 by 2. Rated 5 out of 5 by Anonymous from Beautiful simple elegance This was chosen for me by my now fiancé and I have to say I couldn't have picked a better ring myself. Its classic and timeless but elegant and stunning. It sparkles perfectly and makes me smile every time I see it, even a few months on.